The Roxtec ComPlus frame is a lightweight composite (PA) frame suitable for constructions where it is important to keep weight down to a minimum. The frame consists of sections put together as one single frame or multiple openings in width. 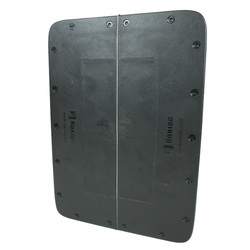 The frame has integrated knock-out covers that are easily removed before routing cables or pipes. Roxtec ComPlus is well suited to bolting or riveting.